Windows 7 compatibility (that is, “Compatible with Windows 7”) carries the assurance that vendor products meet with Microsoft standards (in this case, Windows 7 Media Player) for easy installation and reliable operation. When shopping for your compatible media player, look for the Compatible with Windows 7 logo shown in Figure 3. Figure 3. Compatible with Windows 7 branding indicates compatible products and services for the device. After you have your device, open WMP and connect the device to your computer. WMP gives you the option to choose between Automatic and Manual sync methods when first setting up synchronization. For a description of these methods, see the corresponding section that follows. If you decide later to change the sync method then right-click the media player entry in the Navigation pane and choose Properties. On the Sync tab you can then select or clear the Start Sync When Device Connects check box. Due to the healthy rivalry between Microsoft and Apple, iPod users cannot directly synchronize media libraries and playlists using WMP. However, compatibility plug-ins overcome this obstacle, enabling iPod synchrony with WMP. For one such example, see www.mgtek.com/dopisp. Click the Sync Options icon on the Sync tab, and select Set Up Sync. 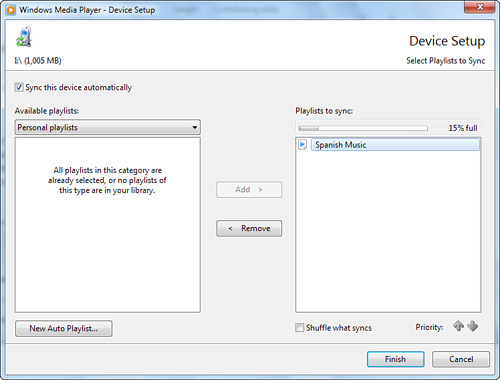 In the Device Setup dialog box, shown in Figure 4, you can choose the playlists that are synchronized with your device. Using the available playlists, click Add to sync the selected playlist with the device. To stop a playlist from synchronizing, select it in the Playlists to Sync list and click Remove. Figure 4. The Device Setup dialog box allows you to choose the playlists to sync and their priority. To make sure your favorite playlists sync in the event that your device runs out of storage space, use the priority arrows in the Device Setup dialog box to set the priority of the selected playlist. WMP 12 defaults to manual mode when there is insufficient space to synchronize playlists. 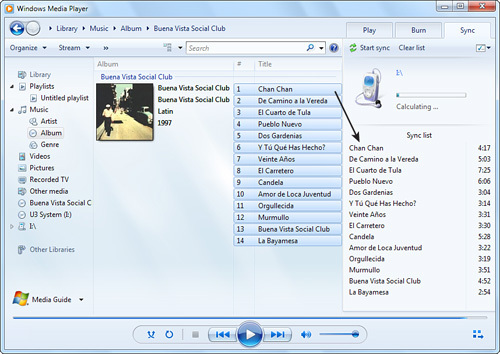 Select the Sync tab and clear the Sync List by clicking the Clear List button, as shown in Figure 5. Figure 5. The Sync tab enables you to manually set up your Sync List for your device. Find your media in your library and drag them to the List pane to add them to the Sync List, as shown in Figure 5. To select multiple items, hold down the Ctrl key while selecting your media. To remove items from the Sync List, right-click the item and select Remove from List. After you have set up your Sync List, make sure that all the items will fit on your device by looking at the List pane just above the Sync List. Remove any necessary items from the Sync List and click Start Sync.